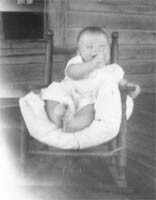 On March 10, 1940 in Ryan, Oklahoma, Carlos Ray Norris was born... with unconfirmed rumors that he had a full beard and roundhouse kicked the doctor for spanking him! He has two younger brothers, Wieland (deceased) and Aaron (a Hollywood producer and current UFAF CEO). He joined the United States Air Force as an Air Policeman (AP) in 1958 and was sent to Osan Air Base, South Korea. It was there that Norris acquired the nickname "Chuck" and began his training in Tang Soo Do and Judo. Upon his return to the states, Mr. Norris began competing in and teaching the martial arts. In 1968, Mr. Norris won the Professional Middleweight Karate champion title, which he held for six consecutive years! He is the first man from the Western Hemisphere to be awarded an eighth degree Black Belt Grand Master ranking in the art of Tae Kwon Do. In 1969, Mr. Norris made his acting debut in the Dean Martin film The Wrecking Crew. At a martial arts demonstration in Long Beach, Norris met the soon-to-be famous martial artist Bruce Lee. In 1972, he acted as Lee's nemesis in the movie Way of the Dragon (titled Return of the Dragon in its U.S. distribution), which is widely credited with launching him toward stardom. Today Chuck Norris is an international television and film star and has starred in 23 motion pictures such as Delta Force, Code of Silence and Missing in Action, just to name a few. His television series “Walker, Texas Ranger”, ran for 81/2 years. With 203 episodes, is the most successful Saturday night series on CBS since “Gunsmoke”. Internationally, it is seen in more than 80 countries worldwide with an average of 1 billion viewers daily. Chuck Norris is also a New York Times bestselling author of three books. They include Black Belt Patriotism: How to Reawaken America, and the 2004 autobiographical Against All Odds. Norris has also penned two works of fiction, The Justice Riders and A Threat to Justice. In 2006, he added “columnist” to his list of credits with the launch of his popular internet column on the independent news site WorldNetDaily.com. His weekly column is now widely syndicated and carried by Human Events and Townhall, among other outlets. In 1992 Mr. Norris founded the KICKSTART KIDS Foundation with the purpose of building strong moral character in our youth through martial arts training. His wife, Gena, is also a leading force in this endeavor as the foundations Executive Chairman. By the 1970's, Mr. Norris had revolutionized martial arts in the U.S. and began forming his own style under the names of the "Chuck Norris System" and the "United Fighting Arts Federation" or "UFAF". In 1988, Mr. Norris once again became a leader in the martial arts community by recognizing and bringing the Gracie family, founders of Gracie Brazilian Jiu-Jitsu, to the 1988 UFAF Convention in Las Vegas, NV to introduce their style to his black belts. Later, Mr. Norris would go on to earn a black belt under the Machados, cousins of the Gracie family, and begin incorporating this training into his own style. In 1990, Chun Kuk Do™ was founded. The style of Chun Kuk Do™ was originally based on Mr. Norris' Tang Soo Do training in Korea while he was in the military. During his unprecedented competitive fighting career (undefeated world middleweight karate champion six years running), Mr. Norris began to evolve the style to make it more effective and well-rounded. He did this through committed study of other systems which he felt would complement his Tang Soo Do foundation. This evolution, along with his personal commitment to excellence, resulted in his phenomenal success. This openness continues today, as Chun Kuk Do™ continues to evolve to include aspects of other systems, or completely original aspects which make it more complete. The United Fighting Arts Federation™ (UFAF) became a corporate entity to be the governing body of Chun Kuk Do™ and a board of directors was formed. CKD is not an ad hoc collection of various techniques from different systems. Rather, it is a style with a deeply-rooted traditional foundation of its own - now unique and different from its Tang Soo Do predecessor - to which various other elements that complement its fundamentals have been added. 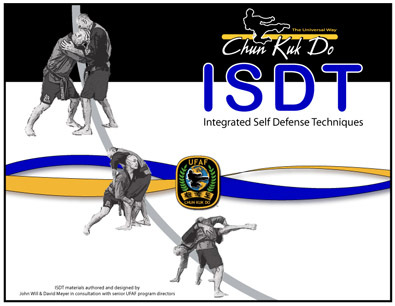 Chun Kuk Do™ has come to emphasize self defense, competition, weapons, grappling, fitness, and more. 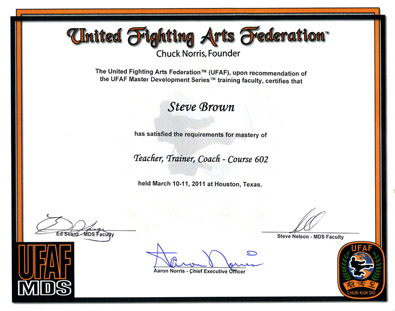 The United Fighting Arts Federation™ (UFAF) is an increasingly worldwide martial arts membership organization founded by Mr. Chuck Norris. Members of the organization study the style of Chun Kuk Do™ ("The Universal Way"), also founded by Mr. Norris. 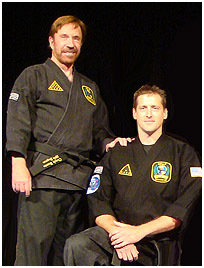 Chun Kuk Do™ rank certification by UFAF and Chuck Norris! UFAF is the governing and sanctioning body for the Chun Kuk Do™ style, providing technical standards for instruction and advancement in the system. 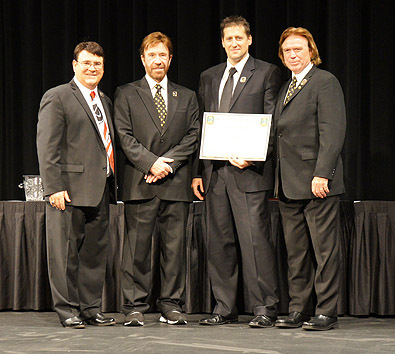 Members of UFAF receive certification of their Chun Kuk Do™ rank from Mr. Norris himself! Aside from UFAF, the only other organization in the world where this happens is KICKSTART KIDS, UFAF’s official charity, also founded by Mr. Norris. 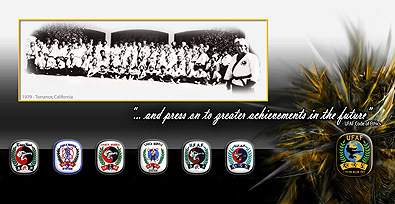 UFAF is guided by it's National Board of Directors and Advisory Board that work to continually evolve and grow UFAF as a provider of martial arts programs, certifications and training to it's members, and the world's martial arts community. 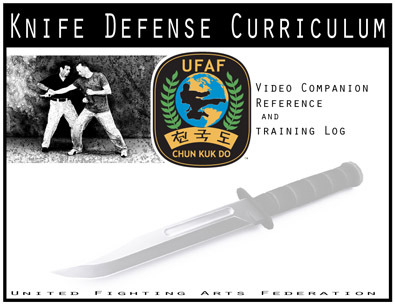 A United Fighting Arts Federation™ (UFAF) authorized Chun Kuk Do™ School Charter is required for any school or individual to teach the art of Chun Kuk Do™. This charter insures that the school or individual has met the requirements set forth by UFAF to insure a safe environment for students with a credible instructor that is current with certifications and training methods outlined by UFAF. 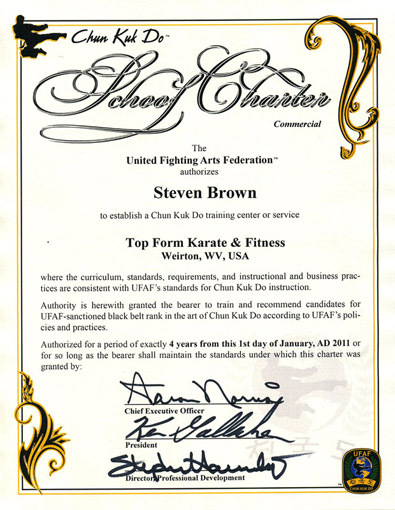 Top Form Karate & Fitness is a 100% compliant Commercial UFAF Chartered Chun Kuk Do™ School. At the end of each session there is a test for certification. Successful certification is required for black belt promotions to 5th & 6th degrees and required to maintain a UFAF Chun Kuk Do™ School Charter. Top Form Karate & Fitness is part of the UFAF Region 8. At this time Region 8 consists of the Northeastern US and Eastern Canada. Each region has a regional chair that is responsible for organizing and conducting official UFAF black belt pre-tests and tests, as well as regional seminars and event. The chair also acts as the next level of "authority" in the organization for official business and disputes that may arise among that region's students, instructors, and school owners. Mr. John Presti was the previous regional chair, based out of Niagara Falls, NY, for many years. Mr. Presti is also a UFAF National Board member and has moved to another assignments in the organization. The current Region 8 Chair is our very own Mr. Doug Shaffer, 5th degree master rank and assistant instructor at Top Form Karate. Mr. Steve Giroux, owner of Giroux Brothers Martial Arts outside of Boston, MA, is acting as the assistant regional chair at this time. 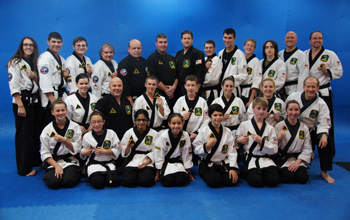 Black belt testing happens two times per year, around April and October. The location for the test rotates around the region to different schools, with consideration given to the travel burden on the majority of test candidates, test board availability, and local events. Thunder MMA Academy - Watertown, CT - Mr. Daniel Semeraro Jr.
ISDT (Integrated Self Defense Techniques) is the hand-to-hand portion that is based on stand-up defense, clinching, takedowns, and core Jiu Jitsu elements for control and/or submission on the ground. This curriculum was designed for UFAF by Mr. John Will and Mr. David Meyer, both veteran black belts in Brazilian Jiu-Jitsu under the Machado family. 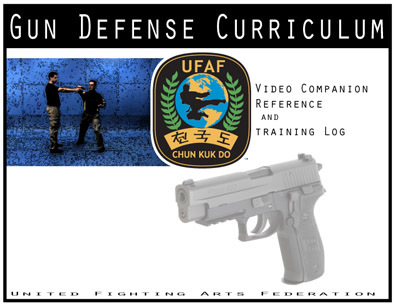 They Gun Defense Curriculum, developed by UFAF's own Joe Gemma, 8th degree black belt and retired Las Vegas Metro Police Dept. Lieutenant, is our style's curriculum based on a very simplistic progression of techniques to gain control of an attacker's weapon when in close quarters and eliminate the threat or escape. Some techniques from all of these courses are incorporated into our regular teen/adult Chun Kuk Do™ program and any student can purchase the full curriculum with log book to work toward full certification. Certification in at least one is required for testing eligibility for 3rd degree black belt. The Chun Kuk Do™ International Training Conference (ITC) and Chun Kuk Do™ World Championships is held every year in Las Vegas, NV around the 3rd week of July. UFAF members from around the world come together for training and competition and to celebrate our style and the UFAF organization. 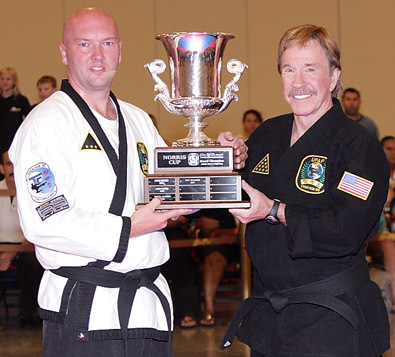 Mr. Chuck Norris and Mr. Aaron Norris are usually in attendance to enjoy the weekend with old and meet new students and black belts of Chun Kuk Do™. The week long event includes training session for youth and adult students, instructor development for black belts, professional business training for school owners, and competition in traditional kata, open kata, team fighting, individual fighting, demo teams, weapons kata and jiu-jitsu. For more information on attending the ITC in Las Vegas, watch for registration details to be posted on our events page and the Top Form Karate Facebook page. 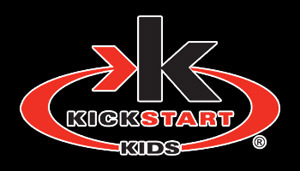 KICKSTART KIDS is a 501(c)(3) non-profit organization, founded by Mr. Chuck Norris, with a mission to build strong moral character in our youth through martial arts. KICKSTART KIDS in the official charity of UFAF and Top Form Karate & Fitness is a proud supporter of the KICKSTART KIDS program.